Racial discrimination can be defined as the intolerance of another group of people mainly because of their race, educational level, and historical background. Racial discrimination has been a long time issue which hasn’t been solved throughout history. It might have decreased throughout time, but the mark that it left hasn’t been erased yet. There are still a great number of people who get violently beaten up or hurt with the comments that the majority of people give them when they’re outside and in a public place. I started getting passionate about the issue when I saw some innocent people, who were from different racial backgrounds,on the news getting hassled to the ground and being shot by white police officers. I saw this happen multiple times throughout these different news stories, and I was concerned on how badly people were being treated because of their race. Mostly all the police officers were white Americans in these stories, and the people getting shot were African Americans who were just standing by their vehicle and doing nothing to provoke an officer to attack them. Also another event which I saw happen when I went shopping once, was that I saw a small group of people protesting for equal rights in the streets. Even though they were a small group of people from a minority, they still did a good job conveying how wrong it was to mistreat people like them. And then from that day I started to investigate more on the issue of what racial discrimination was and how it affected people in negative ways. I knew a few things on racial discrimination before I actually started researching more on it. I knew that mostly Hispanics and African Americans are being affected by racism, because of how some of their ancestors were slaves and always part of the minority groups in society. A solution to racial discrimination could be to start to get equal rights and education for both whites and Africans in order to make them have at least the same amount of knowledge of the world. And mostly majorities are stopping this solution from happening, as they were in constant fear for the minorities gaining too much power in the world. With this power in their hands the majorities believed that their power in the world would eventually diminish and decrease to nothing. After I researched more on racial discrimination I now know how an African American president, who had suffered the racial views of society on himself, would be a possible Allie to have to bring equal rights across to the African Americans and Hispanics who are being discriminated. His position as President could be very to strong to pass laws which could bring this change across. And with the growing economy during the 2000’s, the government and president could’ve been able to pay and build more institutions in order to help the minorities who are poor, homeless, and would be better off in the world with a greater education. I also learned that the majority of whites, who are at the top of the social class as of now, thought that it wasn’t a problem that the minorities weren’t having the jobs that they were doing themselves. 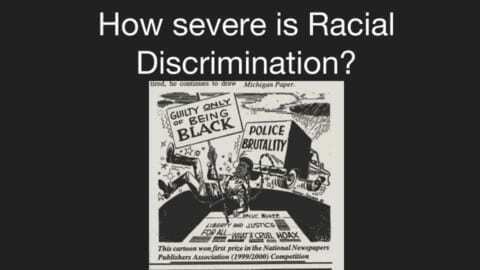 This led to the increase in discrimination, and lower-classed views that whites have on African Americans and Hispanics. I didn’t know this before, but now I feel more passionate about the issue and more willing to help the voices of those who have been discriminated and neglected for many years. URGENT! Racial Discrimination Has Been A Problem For Too Long by Isha is licensed under a Creative Commons Attribution-ShareAlike 4.0 International License.